MCLEAN, VA--(Marketwired - Mar 20, 2014) - Freddie Mac (OTCQB: FMCC) today released the results of its Primary Mortgage Market Survey® (PMMS®), showing average fixed mortgage rates moving down slightly after last week's uptick, and remaining within range of average fixed rates for the first quarter of 2014. 30-year fixed-rate mortgage (FRM) averaged 4.32 percent with an average 0.6 point for the week ending March 20, 2014, down from last week when it averaged 4.37 percent. A year ago at this time, the 30-year FRM averaged 3.54 percent. 15-year FRM this week averaged 3.32 percent with an average 0.6 point, down from last week when it averaged 3.38 percent. A year ago at this time, the 15-year FRM averaged 2.72 percent. 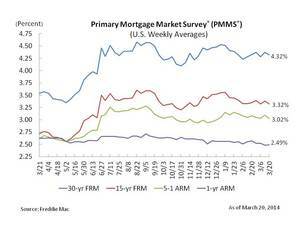 5-year Treasury-indexed hybrid adjustable-rate mortgage (ARM) averaged 3.02 percent this week with an average 0.4 point, down from last week when it averaged 3.09 percent. A year ago, the 5-year ARM averaged 2.61 percent. 1-year Treasury-indexed ARM averaged 2.49 percent this week with an average 0.4 point, up from last week when it averaged 2.48 percent. At this time last year, the 1-year ARM averaged 2.63 percent. "Mortgage rates eased this week as housing starts declined 0.2 percent in February to a seasonally adjusted annual rate of 907,000, below consensus forecast. The rate on the 10-year treasury note rose following the Fed's announcement Wednesday afternoon and, if this holds, interest rates may begin to trend higher going into next week."